As pharmacists, we pride ourselves on employing best practices to ensure patient safety when compounding hazardous medications. However, the concept of practice excellence involving hazardous medications entails more than simply complying with USP <797>; providing proper protection for all who come in contact with these medications, particularly those who handle these substances every day, also should be required. The basic tools and products used in standard drug compounding—needles, syringes, vials, bags, etc—are not designed to isolate the medications they manipulate; rather, they are intended to enable the activities of medication transfer, regardless of what substances are being manipulated. The level of safety provided by these tools becomes alarmingly insufficient when manipulating and compounding cytotoxic products. In today’s hospital pharmacy environment, closed system transfer devices (CSTDs) are the only devices that have been specifically designed to protect health care workers from occupational exposure to hazardous substances. Thus, it is essential for facilities that compound and administer hazardous medications to consider these devices to minimize risks to employees and patients. With mounting evidence at hand, it seems particularly audacious to state or imply that cost is a prohibitive factor to the implementation of CSTDs. Most hospitals spend millions of dollars on state-of-the-art technology and spend millions more on protecting staff members from these devices. For example, after acquiring a Gamma Knife, our facility had to install 10-inch lead walls and reinforced concrete around this particular device to prevent leakage of radioactive isotopes elsewhere in the building or out into the community. The cost of implementing CSTDs into standard operating procedures pales by comparison. Although purchasing CSTDs should be seen as a cost of doing business with hazardous medications, they still need to be included in pharmacy budgets, a process often made difficult by separating the cost of the drug from the cost of the device. To address this, the cost of CSTDs can be included as a necessary part—albeit, a relatively minor part—of the facility’s drug expenditure for cytotoxic products, given that they are a vital instrument in the overall management of those products. At Nebraska Methodist Hospital—a 440-bed facility—our annual budget for medication acquisition is approximately $9 million, so allocating $50,000 to $80,000 per year toward proper personal protective equipment (PPE) and CSTDs is almost an afterthought. Clearly, the actual cost depends on the number of cytotoxic doses produced and we average ten to fifteen doses a day of injectable, hazardous medications, but this number can reach up to twenty. For some reason, certain hospital pharmacies have chosen to codify CSTD cost as a distinct line item unaffiliated with its attendant medications in the overall budget. This often leads these products to be viewed as extra or superfluous. In order for these items to be seen as a matter of course, our way of thinking has to change. Safe and proper handling of hazardous drugs must go hand-in-hand with use of CSTDs. The concept of state boards of pharmacy introducing regulations or requirements for the use of CSTDs is not new, but currently, very few have any specific language covering this in their regulations. One of the problems with this approach is the common division of institutional pharmacy practice and stand-alone clinics’ administration of chemotherapy. For example, in Maryland—one of the few state boards that does address the use of CSTDs in its pharmacy regulations—the language discussing CSTD use appears under pharmacy regulations, but if cytotoxic medications are handled at a stand-alone oncology office or physicians’ office, those facilities are generally exempt from state pharmacy regulations. This reality is quite unfortunate given that oncology medications are now commonly administered in ambulatory or outpatient clinics and physicians’ offices, and often are not managed by a pharmacy at all. It is important to keep in mind that all currently available CSTDs offer safer conditions than what was available before, which was nothing. However, much like any device or technology meant to enhance human activities, these products are not infallible. Once the FDA approves a device via the 510(k) clearance process as being a CSTD, then it technically is a CSTD. This does not mean that all devices will automatically prevent the introduction of hazardous particles into the environment 100% of the time, as human error must always be taken into account. All of the currently available devices have distinctive differences in how they provide protection. Some use a bladder to contain vapors or to adjust the pressure in the vial; some use a charcoal filter and others use a .22-micron paper filter. Most devices use some type of Luer locking mechanism to secure the device as medication is drawn out and some use a double membrane that essentially wipes off the needle entering and exiting its own device to prevent the release of particles. These represent several different mechanisms specifically designed to contain and minimize occupational exposure to hazardous products both for pharmacy and nursing staff. 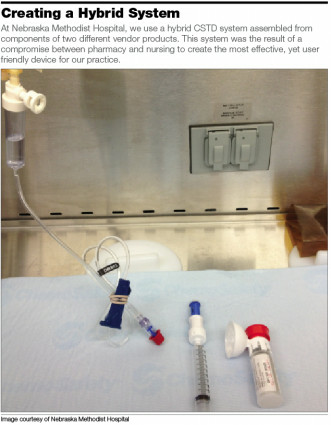 This also illustrates an important point; these devices are only truly effective if used properly and throughout the complete hazardous medication administration system, beginning with the pharmacy compounding the medication and ending with nursing administration at the bedside and wasting of the device. If a device is used in the pharmacy, but then is removed or disabled at some juncture, nurses, technicians, or even patients may become exposed. As such, the use of these devices must be viewed in a systemic cycle. In order to ensure this is the case, collaboration between nursing and pharmacy again rises to the forefront. This should involve continuous rounding by pharmacy to assess nursing administration and disposal practices. At Nebraska Methodist, we perform hazardous drug rounding at least once a month to check all aspects of the administration and disposal process. Because of the number of steps and staff members involved in the use of hazardous medications, remaining diligent and open to adjustment will help maintain compliance. One of the unique issues surrounding use of CSTDs is the fact that (at least) two distinct departments—pharmacy and nursing—must both be able to work efficiently using the device, even though their respective uses of that device differ. In our facility, we initially selected a single vendor for our CSTDs, which proved effective during compounding—we performed the manipulations, attached the closed system device, and then sent the product to the nursing unit confident in our safety measures. Shortly thereafter, we performed rounding to observe nursing practices when administering a hazardous dose, only to discover they were twisting off the devices and throwing them into the trash, thereby opening the closed system. When questioned about this practice, we were given a demonstration of the nursing process, and realized that for them, it had become cumbersome and time-consuming to manipulate the device for administration. To compromise, we incorporated a piece from another vendor’s CSTD, which allowed us—after testing its integrity—to maintain a closed system. Nursing agreed that the hybrid device alleviated their frustrations while we were able to maintain our goal of protection and safety. This was a perfect example of how multidisciplinary collaboration and compromise enabled a safe, workable system that was accepted by all users, and we continue to use this hybrid system today. As CSTDs are meant to protect employees across multiple disciplines, representatives from those disciplines must be involved in product selection and implementation plans. Chief among stakeholders should be pharmacy and nursing management. Oncology nurses and specialists, as well as the nurses that actually administer hazardous medications also should be represented. Among pharmacy’s representatives should be the actual pharmacist(s) and/or technician(s) that compound these products. Although other administrative personnel can be involved, these individuals’ opinions should carry the most weight, as they are the front-line staff working directly with hazardous substances and are most likely to be adversely affected by mishandling. One primary concern for these decision makers should be the fact that any established or new devices under consideration need to be assessed for integration compatibility within your medication preparation and distribution system. Likewise, ease of use is a very important factor. At Nebraska Methodist, we performed a time-motion study and found that one device took more time to use than two others. Consider a busy oncology clinic with only a single pharmacist or technician performing compounding; saving extra minutes per dose can become quite valuable. Furthermore, use of such devices can create repetitive motion issues, so ensuring the use of an ergonomically sound device for specific individuals to be able to compound quickly, safely, and consistently is crucial. While ergonomic factors are important, it is also key to review the consistent sturdiness and forced functions enabled by these devices. 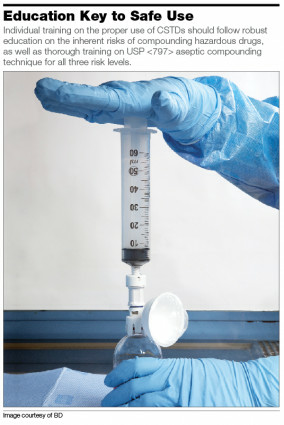 The practice of hazardous drug compounding can be difficult to standardize and prior to the introduction of CSTDs, there was little other than proper aseptic technique to ensure consistency. These devices are designed to create an equalization of pressure, so it can be difficult to deviate from properly using them. All of the parts lock firmly into place and are very secure, thereby essentially forcing the user to exercise good practice. This by no means guarantees complete safety, and there is no replacement for proper aseptic technique, but having a rigid, closed system helps avert compounding practice variations. Fundamental to proper training on the use of CSTDs is instilling a basic understanding of the risks present in working with hazardous drugs. Our pharmacy staff understands these risks because it is our responsibility, and that of the hospital, to inform them. OSHA requires health care facilities to disseminate clear information indicating what medications are considered hazardous, where they are stored, what personal protective equipment to use in handling them, and so on. In addition, specific staff members should be assigned to exclusively handle these products and any staff not indicated thusly should not be permitted to handle them. Once the process of educating staff on the risks is complete and a suitable worker pool has been established, the next step is ensuring those staff are thoroughly trained in sterile compounding techniques with USP <797> guidelines for all three compounding risk levels—low, medium, and high. Once these standard compounding training activities have been established, training on the proper use of CSTDs—including why they are used—should be initiated. This should involve use of the device within an isolator or other primary engineering control. Technique is evaluated while the trainee manipulates a fluorescent liquid using a CSTD, among other compounding practices. Once proper technique has been validated, we allow the trainee to compound medications in the presence of the trainer. Training on actual compounding always is performed one-on-one with an experienced staff member. After the trainee demonstrates competency in all phases, they are approved for work in aseptic and hazardous drug compounding. In order to maintain compounding acumen, we perform technique and procedure assessments annually thereafter. When we first implemented CSTDs, a vendor representative came onsite for four days of intensive training, including two days spent in the pharmacy. During this time, we also established super users among pharmacy and clinical nurse specialists who were specifically trained on how to train other staff members. Before our nursing staff can administer hazardous drugs they have to be certified for that activity. Thus, if we have a patient in the ICU, as opposed to the oncology unit, who needs a dose of chemotherapy, a certified nurse from oncology will go to the ICU to administer that medication. Nursing management uses a checklist for this process that includes accounting for all necessary PPE and supplies, disposal steps, and visually denoting that a patient is receiving hazardous medications in that area with a placard. Currently, among the 85 full-time staff in the pharmacy department at Nebraska Methodist, we have a minimum of 15 employees trained and certified as super users for compounding hazardous drugs. In addition to this, we created a sterile compounding specialist position and this staff member has oversight of regular sterile compounding, as well as hazardous compounding. It is this employee’s duty to perform the annual validations of aseptic and hazardous compounding technique and to remain abreast of any new products or training techniques that could improve our processes. Without question, when used properly, closed-system medication transfer devices provide significant protection to staff and patients who interact with hazardous drugs. However, it is essential to keep in mind that CSTDs are just one piece in creating a complete hazardous drug safety program. 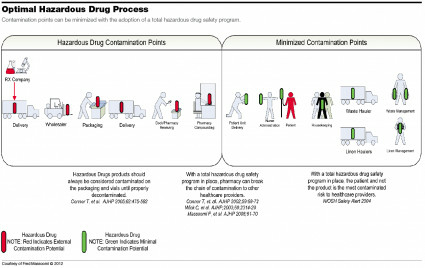 How hospitals create their formulary, determine processes for receiving and stocking hazardous products, and approach teaching and assessing proper aseptic technique are all equally important. Further to this, attention to details such as cleaning IV bags, delivering finished products to nursing units, and ensuring safe and proper administration all the way to the point of disposal are considerations that impact overall safety. Ultimately, putting those tools shown to provide protection from hazardous materials in the hands of front-line staff always should be an obligation of any health care facility. Valanis B, Vollmer WM, Steele P. Occupational Exposure to Antineoplastic Agents: Self-Reported Miscarriages and Stillbirths Among Nurses and Pharmacists. J Occup Environ Med. 1999 Aug;41(8):632-8. Wick C, Slawson MH, Jorgenson JA, Tyler LS. 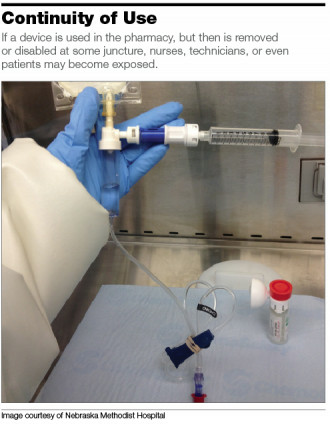 Using a Closed-System Protective Device to Reduce Personnel Exposure to Antineoplastic Agents. Am J Health Syst Pharm. 2003 Nov 15;60(22):2314-20. CDC. National Institute for Occupational Safety and Health. Approaches to Safe Nanotechnology: Managing the Health and Safety Concerns Associated with Engineered Nanomaterials. DHHS (NIOSH) Publication No. 2009–125. March 2009. Firouzan “Fred” Massoomi, PharmD, FASHP, received his doctorate from the University of Kansas School of Pharmacy and is the pharmacy operations coordinator at the Nebraska Methodist Hospital. He currently serves on the Nebraska Pharmacists Association Board of Directors. Fred can be reached at Fred.Massoomi@nmhs.org. The OnGuard Contained Medication System with TEVADAPTOR components from B. Braun is a closed-system transfer device that helps protect clinicians from exposure to hazardous drugs, including liquid, gaseous, or particulate exposure, during admixture, transport, administration, and disposal. A closed system for drug reconstitution and administration, OnGuard meets the NIOSH definition of a closed-system transfer device, and supports compliance recommendations made by NIOSH, USP <797>, and ASHP for handling hazardous medications. OnGuard is easy to learn and use, and helps protect clinicians using passive needle safety while providing tactile and audible feedback to confirm secure connections. The EQUASHIELD CSTD features a fully closed syringe unit with a built-in and totally self-contained pressure equalization system with dual needle air-to-liquid exchange, keeping vapors and aerosols inside. The syringe barrel is sealed in the back, protecting against syringe plunger contamination. The factory preassembled, ready-to-use syringe unit is equipped with a dry, leak-proof connector that is welded to the syringe to protect against Luer disconnections and spills. EQUASHIELD’s vial adaptor firmly snaps onto any standard drug vial, providing a safe and contamination-free access port for the syringe unit. In order to withdraw or inject fluids, the user simply slides the syringe over the adaptor’s docking port, inverts the vial, and withdraws the medication. The pressure equalization takes place automatically and all contaminants remain enclosed in the syringe unit. The connector uses tight-seal double membranes, keeping connectors dry as well as residual- and coring-free, even with multiple entries. Syringe units and vial adaptors are available for all relevant volumes and vial neck sizes. The EQUASHIELD system includes additional adaptors and connector pairs for safe transfer of drug to IV bags and for administration procedures, including IV push and IV tubing. The BD PhaSeal System is a closed-system transfer device that has been proven to prevent exposure to the contents of hazardous drug vials during preparation, administration and disposal. The system meets the airtight definition—non-vented protector ensures no exposure to hazardous aerosols and vapors—and leak proof definition—elastomeric membranes ensure dry, leak proof connections—of a CSTD and complies with NIOSH, USP <797>, ISOPP, ASHP, ONS, and APHON guidelines and definitions. The BD PhaSeal System is universally compatible and is designed to meet the variety of requirements and preferences of your facility to prevent hazardous drug exposure when connecting and disconnecting from vials, syringes, IV bags, and IV lines. BD PhaSeal is widely used and has been providing evidence-based protection from hazardous drugs for more than fifteen years. The ChemoClave system from ICU Medical is a mechanically and microbiologically closed system that is safe and easy to use during the entire hazardous drug handling process. The ChemoClave CSTD incorporates a needle-free design that enhances safety by completely eliminating the possibility of hazardous needle sticks and ensures compliance with safe-handling policies. The system requires no difficult assembly of components and features an automatic self-sealing technology that helps users prevent spills when transporting hazardous drugs. It also protects users and the environment, as it generates minimal biohazardous waste and is cost effective to implement. ICU Medical provides a simple, safe, and secure needle-free closed system transfer device to help enhance healthcare worker safety and comply with OSHA, NIOSH, ASHP, ISOPP, ONS, APHON, and USP <797>.